Known as "A girl from Yamhill," reading about Beverly Cleary's life you might think it was one of her characters in a book. She has an interesting yet ironic story that many people can appreciate and relate to. Born in 1916, she grew up on a farm in Yamhill, Oregon. This town was so small it had no library and her mother arranged with the State Library to have books sent to them. Her mother acted as the local librarian and used a room on the second floor of the local bank as the library. When Beverly was six she moved to Portland and attended her first grammar school. However because she came from such a small farming community, she didn't have any schooling experience and found it hard to adjust to attending a classroom with 40 other students. Here she was put into a low reading circle and that is one of her reasons for writing books, to sympathize with struggling readers. She found the books available at that time didn't relate to children where she lived and often were only about English or Pioneer children. She wanted to read books about children like that in her neighborhood and everyday experiences. Once she got over her difficulty of reading by the 3rd grade, books became her passion. The book that really turned things around for her was The Dutch Twins, by Lucy Fitch Perkins. This is when she really learned to read for enjoyment but realized there still was a need for books about every day circumstances and children like those in her neighborhood. With her dreams about becoming a writer, it was only fitting that she choose to attend college in California where many go to fulfill their dreams as well. As a young women "who was sure where she wanted to go but did not know if she could find the money to get there," she ended up attending a junior college in Ontario, California where she got her Associate of Arts degree. She continued on to graduate from the University of California at Berkeley with a Bachelor's of Arts degree in English. She then continued to pursue her dream and got a degree in librarianship at the University of Washington in Seattle. After completing this degree she got her first full time job as a librarian and ran into students that also were searching for the kind of books she was as a child. 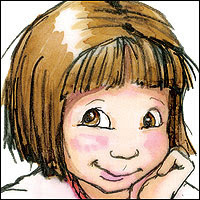 That prompted her to write her first book Henry Huggins, where the character of Ramona Quimby made a debut. When asked in an interview what prompted her to write the character of Ramona Quimby she replied by saying it was accidental because when writing the Henry book, it occurred to her that all the children appeared to be only children, so she added a little sister. She had heard someone yelling the name Ramona out the window and that's how it started. Then she was inspired by a little girl that lived near Cleary who was considered rather impossible. Cleary has a memory of the little girl coming home from the grocery store and she has a pound of butter, which she had opened and was just eating it. Ramona appeals to many young readers because she is a normal and an imperfect everyday kid and according to Cleary doesn't learn to be a better girl. She has won numerous awards for her books as well as received 35 state awards based directly on reader votes. She receives thousands of letters from her readers every year and that is how her Newbery Medal winner, Dear Mr. Henshaw was created. She received two letters from little boys, who didn't know one another, asking her to write about a boy whose parents were divorced and she decided to give it a try. Writing about a young boy going through his parents divorce, is another example of how Beverly Cleary writes about topics that relates to her readers and reaches such a large audience. Her books are available in over twenty countries and in fourteen different languages. In honor on Beverly's birthday this year they choose her birthday to celebrate national D.E.A.R day.